There are only a few symbols that are as meaningful as the infinity sign. 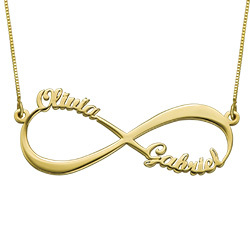 The sterling silver Personalized Infinity Necklace is a meaningful way to show the world who is forever in your heart. 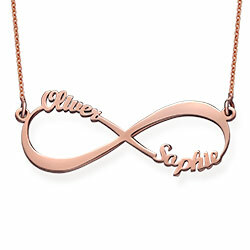 Some people choose to personalize this necklace by adding their own name and the name of their significant other or while others choose to add the names of their children. 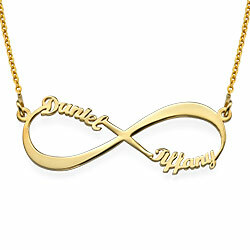 Whichever names you choose, they willl be added to the loops of the pendant in a lovely, modern script font. My wife hasn't taken it off despite having so many necklaces. She LOVES it! My girlfriend absolutely loves this necklace I gave her for Valentine's! It is very shiny and stands out with any outfit she wears I would highly recommend this piece to anyone that is interested in satisfying their girlfriend. And then she will satisfy you later! Beautiful. Everything I had hoped for and imagined it would be. I purchased this for my wife for Valentine's Day and she loved it!! Very happy with the purchase. Both the quality and style are very nice and I will be visiting you on a regular basis. Thank you making my job easier!! Beautiful piece. 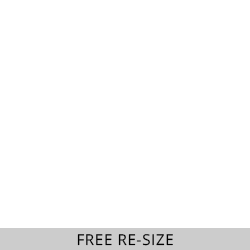 Do NOT pay for expedited shipping as it came days after it was promised.